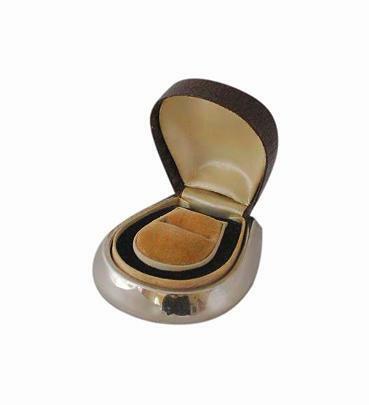 This is a beautiful vintage wedding ring presentation box. It dates to the 1970s and is in very good condition. 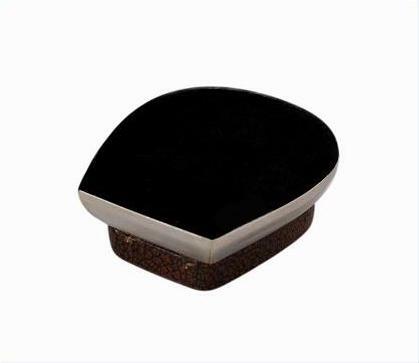 The lid of this box is beautifully shaped and has a deep maroon brown leather finish. 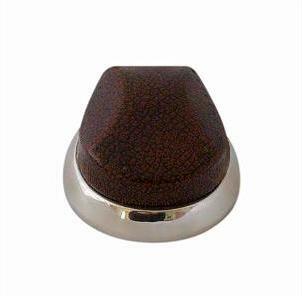 The base is made of non precious white metal and has a glossy polished finish. The bottom of the box has a soft black velvet covering. The box has a quality sprung hinge. The interior compartment has a horseshoe shaped ring storage section in the centre. This is padded and has a soft beige velvet covering. It is beautifully finished by a silk covered frame. Around this frame is a black velvet covered base and a further silk covered outer frame. The inside of the lid has a lightly padded satin lining. This beautiful box is in very good condition. The leather has minor light age related wear but no nasty splits or bald patches. 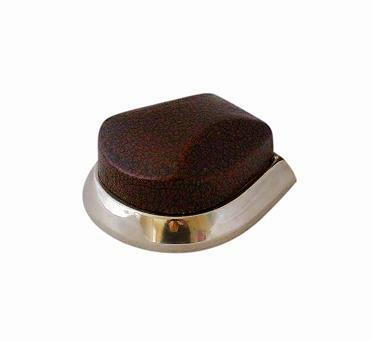 The metal has minor light wear and light tarnish. The interior linings are still in beautiful condition with no splits or fraying. The sprung hinge is still in good working order and keeps the lid securely closed. Length: 6.5cm (across the bottom). Width: 5.7cm (at its widest across the bottom). There is a slot for one ring. This box will be posted FREE within the UK by Royal Mail 1st Class Recorded Delivery. International postage is £25. Delivery is fast, within 3-5 working days to Europe, and 5-7 working days to the rest of the world. Postage is by Royal Mail International Signed For. For Vintage and Antique Jewellery including Wedding Rings and Eternity Rings, please visit our sister shop via the links below. Enjoy £10 off your 1st order plus free next day delivery within the UK. Valid for both single and multiple purchases. See our website for details.